As I was on my holiday this past month, I had plenty of time to relax. Plenty of time to think and along with that came the feeling of-get ready-slight boredom. Ahh, success! To me, a productive part of a lengthy vacation is that feeling of “what do I do now?” After the arrival, the unpacking, the organizing the first exciting day of exploring a new city or even just laying by the beach. But when I am away for just a few days I still return with that aching, somewhat stressful feeling. Relief, yes, but not the same relief as a week (or two or three) away. Every year we travel back to Europe to visit Mr. Giggle’s mother in Germany, we are then lucky enough to spend time in his sister’s stunning vacation home in Mallorca. It is always in Mallorca, when we don’t allow ourselves internet or cell phones, that I reach this point. While children might think it’s insane to wantto feel bored, I feel that as the ultimate relaxation point. When I’ve finished all my backlogged work, when I’ve blogged enough, when I’ve run enough and read enough and swam enough to lay in a chair and think “hmmm. What now?” It’s just the best. 1. 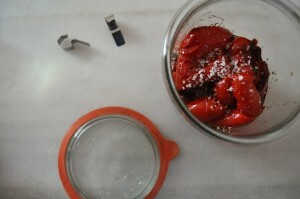 Place the quartered red peppers, garlic cloves and the balsamic vinegar in a medium pot (a 3 qt. or 4 qt. saucepan will do). Be sure they are covered in the balsamic vinegar, if they are not add more to the pot. 2. Place over the lowest flame and gently cook for 30-45 minutes, carefully turning once or twice to move the peppers all around to cook evenly. 3. 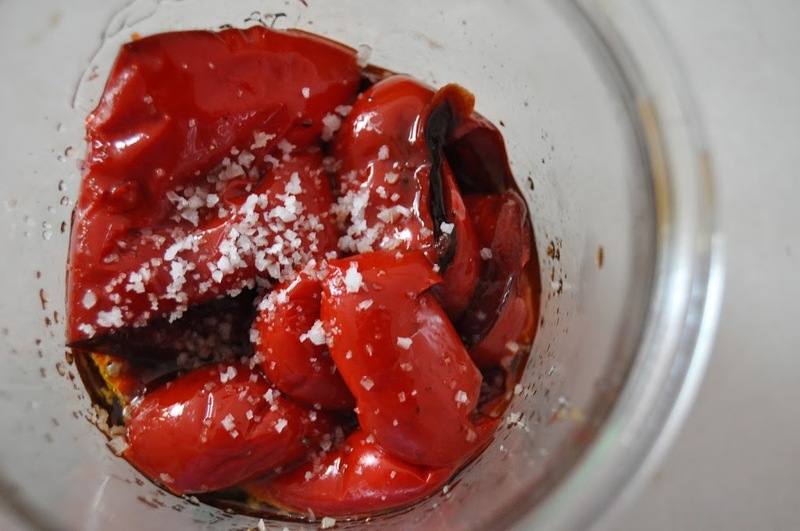 Remove from the balsamic vinegar into a glass jar. Pour some of the balsamic sauce over, enough to cover about ½ – ¾ of the peppers and then add the 2 T. olive oil. Generously sprinkle with fresh cracked pepper and sea salt. Gently stir to combine, cover and refrigerate until ready to use (unless you eat them all before then! ).